What is the Best Home Air Compressor? 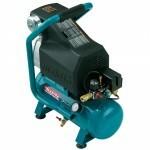 A good air compressor for home use is something every homeowner should have. Those who have one, will never want to go without it. Those who do not, probably don’t realize the amount of time and energy they can be saving. Whether you need to inflate a kiddie pool, air up your car tires, learn airbrushing, build a deck, or put up a fence, a compressor is one of the best investments you can make around your house. So here are the top products that won’t cost you an arm and a leg. We consider the JC10 to be the perfect compressor for all-around home use. It is one of the quietest compressors available so you can use it indoor as well as outdoors without freaking out the cat (too much). Because the Rolair weighs only 39 pounds, you can move it around from project to project without breaking a sweat. The unit puts out 2.3 CFM of airflow which is excellent for its size and will allow you to do almost any task you throw at it. A 2.5 gallon tank allows longer times between pump cycling and a quick recharge time. Since most homeowners have enough maintenance to do around the house, the oil-less pump means the compressor will not be one of them. While the Rolair JC10 may cost you a little more up front, the quality and features make it an exceptional value that will last many years. While it’s definitely not the best looking air compressor, the GMC (not built by General Motors) Syclone is a quiet and good performing compressor that can be had at a great price. 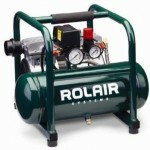 Like the Rolair above, it’s rated at only 60dBA which is as quiet as any compressor you can find. The 6.3 gallon tank is great for filling up large tires but it also makes the 6310 slightly heavier than the Rolair. That said, the two large wheels makes the unit easy to roll around almost anywhere. One of the best things about this oiless compressor is the motor/pump’s 3,000 hour lifespan (most cheap compressors are rated to last about 500 hours). You really can’t go wrong with a Makita. 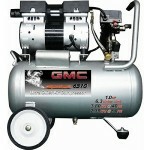 The MAC700 is one of the all-time best sellers when it comes to air compressors for the home. Out of the three on this page, it is the best performer putting out 3.3 CFM of airflow at 90 PSI. It’s great for anything from inflating toys to building a shed. At 52 pounds, it is also the heaviest but this is mainly due to the heavy duty cast iron tank. This unit is made to last! While not as quiet as the others, the MAC700 is still quieter than most. The pump is oil-lubricated but maintenance is easy and it will allow the Makita to outlast most oil-less compressors.